Kazuma Kiryu is a man who knows how to enjoy a nice, cold drink, especially when he has to deal with the stress of raising a child, uncovering the truth behind mysterious accidents, and occasionally taking on massive criminal organisations single-handedly. 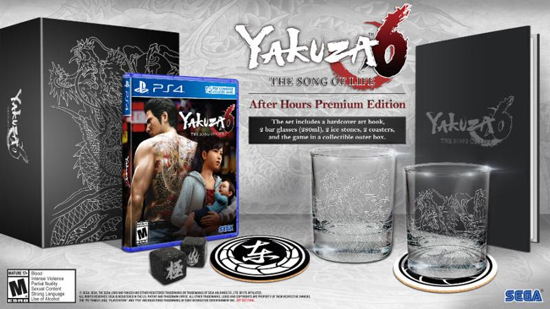 With Yakuza 6: The Song of Life's "After Hours" Premium Edition, you can prepare drinks that would make even the Dragon of Dojima crack a smile. Members of the SEGA Yakuza team take you through everything the Premium Edition has to offer in the Yakuza 6 unboxing video, featuring a special guest appearance by Yakuza series Producer Daisuke Sato! In Yakuza 6: The Song of Life, Kiryu will find out exactly how much people are willing to sacrifice for family - be those ties through blood or bond - when he investigates a series of shadowy events that involve the ones he holds closest to his heart. He'll journey to familiar grounds in Kamurocho and the new setting of Onomichi, a beautiful, sleepy port town in Hiroshima Prefecture, in order to find the answers he seeks. Powered by the brand-new Dragon Engine, the game is the ultimate iteration of Yakuza's blend of gritty crime story, hyper-explosive combat, and all the vices and distractions those locales have to offer. The "Essence of Art" edition is almost sold out! You can pre-order the launch edition of the game which contains a sleek hardcover art book that also doubles as the disc holder! *Please do not attempt to use the ice stones for any real-life Heat Actions despite what the unboxing video may suggest.